Many Canadians have some degree of astigmatism. It is a common condition that can be corrected with contacts, glasses or laser eye surgery. In fact, laser surgery is a viable long-term solution and has a proven record of success in correcting astigmatism. Astigmatism is a visual defect caused by an irregular shape of the cornea. A regular cornea is spherical in shape. When astigmatism is present, however, your cornea is shaped like an egg or football – so it’s steeper in one axis than the other. Astigmatism causes near, far and intermediate vision to be blurry. The cornea is the clear, dome-shaped part of the eye in the front that covers the iris and pupil. It is one of the most important structures as it is responsible for one of the major refractive powers of the eye. Due to the irregular shape of the cornea when astigmatism is present, light is unable to pass through regularly, resulting in blurry vision. Astigmatism can be due to our genetic makeup, or develops as we age. We refer to this as a regular astigmatism. 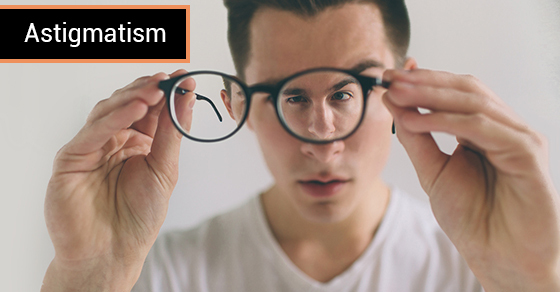 On the other hand, in rare instances astigmatism could be the result of an injury, corneal scarring, corneal transplant or disease such as Keratoconus. In this case, it is then known as an irregular astigmatism. At Skouras Eye and Cosmetic Centre, a comprehensive ophthalmic examination will include testing for astigmatism. After diagnosis, to provide you with the clearest vision possible, your ophthalmologist – Dr. Skouras – will prescribe a solution which best meets your needs. This could be through glasses, contacts or laser eye surgery. How Does Lasik Eye Surgery Treat Astigmatism? Lasik eye surgery is one of the best methods used to correct astigmatism. Astigmatism is a refractive error and, when corrected through laser eye surgery, the results are permanent. The quality of your vision is also better when compared with the quality of your vision in glasses or contact lenses. Contact Skouras Eye And Cosmetic Centre to schedule a free consultation to determine if Lasik eye surgery would be the best option for you.